My flirtation with this fascinating new (to me) fruit began sometime last year when I saw dried goldenberries on the shelf at Costco. My first response was skepticism. “Oh really, Andean superfruit. Wonderful.” (Eye roll). But when I flipped the package around to check out the nutrition facts, I have to admit, I was impressed. Nine grams of fibre?! That’s 3-4 times your typical dried fruit. The “excellent source of vitamin A” checked out — 60% of the daily value (DV), compared to 6% for dried apricots and prunes. Dried cranberries don’t even have enough to put it on the label. And 8% of the DV of iron is nothing to sneeze at, with no other dried fruit I could find clocking in at higher than 2%. Interestingly, they have 3 grams of fat per serving (the heart-healthier kind). You don’t normally see that in dried fruit, but goldenberries apparently have 100-300 tiny seeds per fruit, reminiscent of figs. Those seeds also contribute to the protein (2g per serving), which proponents get excited about. That’s high for a fruit, but insignificant compared to what we typically think of as protein sources. So I tossed a bag in my cart. Turns out, they’re delicious. Tart and a little bit sweet, kind of like dried cranberries. They make a great addition to oatmeal, with pumpkin seeds or pecans. You could try a handful or two with almonds for an afternoon snack, or toss in a salad. Anywhere you’d use dried cranberries, but want more nutrition with less sugar. Still, a handful is around 100 calories, so instead of nibbling your way through a bag of dried goldenberries while watching TV, think of them as a nutritious condiment — something to jazz up your meals and snacks, not replace them. 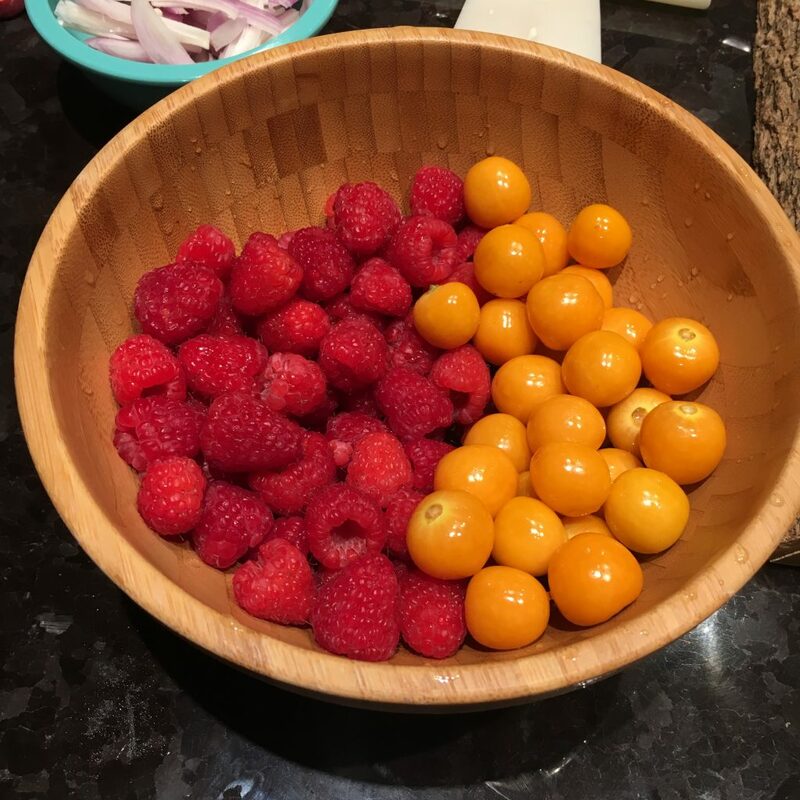 A few months later I spotted fresh goldenberries, again at Costco. I brought them to a dinner party at a friend’s house. They were so sweet, with just a bit of tartness, we nibbled our way through just about the entire container, along with a package of raspberries, while making dinner. But the next batch I got, also from Costco, was decidedly more tart. Not good for nibbling at all, but nice in salads. The latest batch, even more sour. We enjoyed them in fish tacos though. A tangy balance to the cheesy bean sauce. Reportedly, they’re also popular in fruit-based sauces, pies, puddings, chutneys, and jams, although I haven’t tried that yet. By the way, it’s normal for them to be a bit sticky. 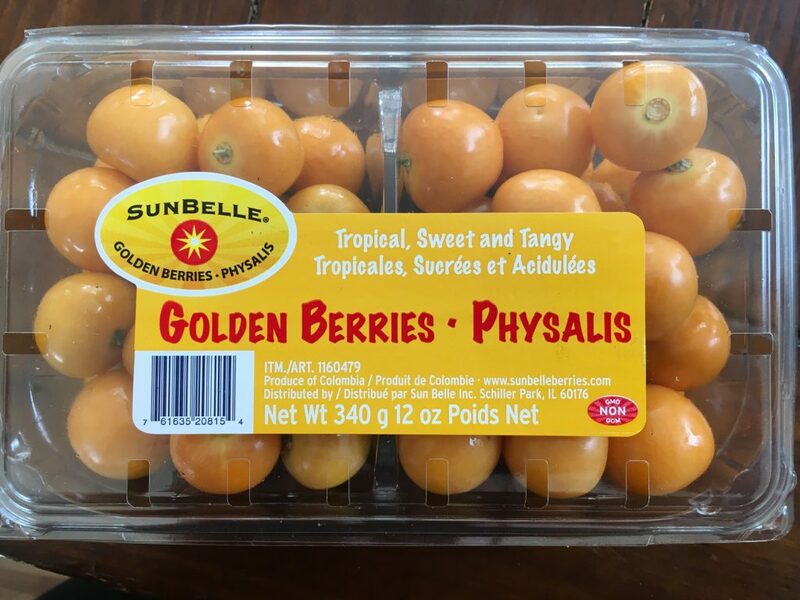 So last week when I decided it was time to actually learn something about this fruit beyond what was on the package, it took me a while to track down nutrition data, because goldenberries are known by several other names. 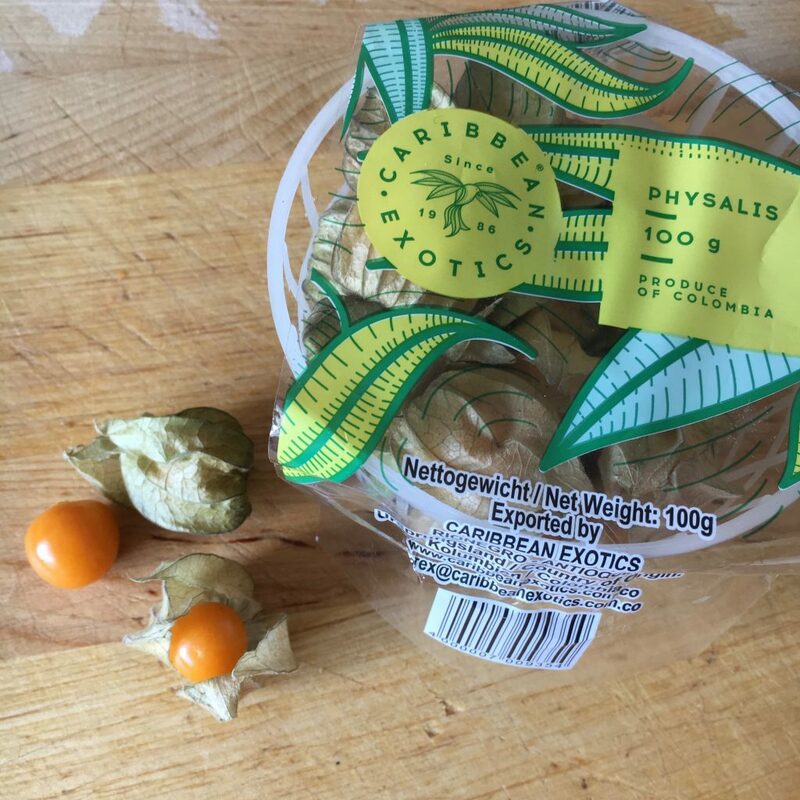 You may have heard them called cape gooseberries, not to be confused with the numerous other fruits called gooseberries (they’re not related). One of the first English-speaking locales where they were popularized was Cape Horn, South Africa, thus the name. You may also see the latin name, physalis. It’s Physalis peruviana, to be precise, in reference to Peru, one of the South American countries where they grow in abundance. You might also see them sold as Inca berries or pichuberries, to capitalize on the cache of Peru’s Machu Picchu. They’re also called giant groundcherries, peruvian groundcherries, poha (in Hawaii), jam fruit (in India) as well as many other names in different languages. 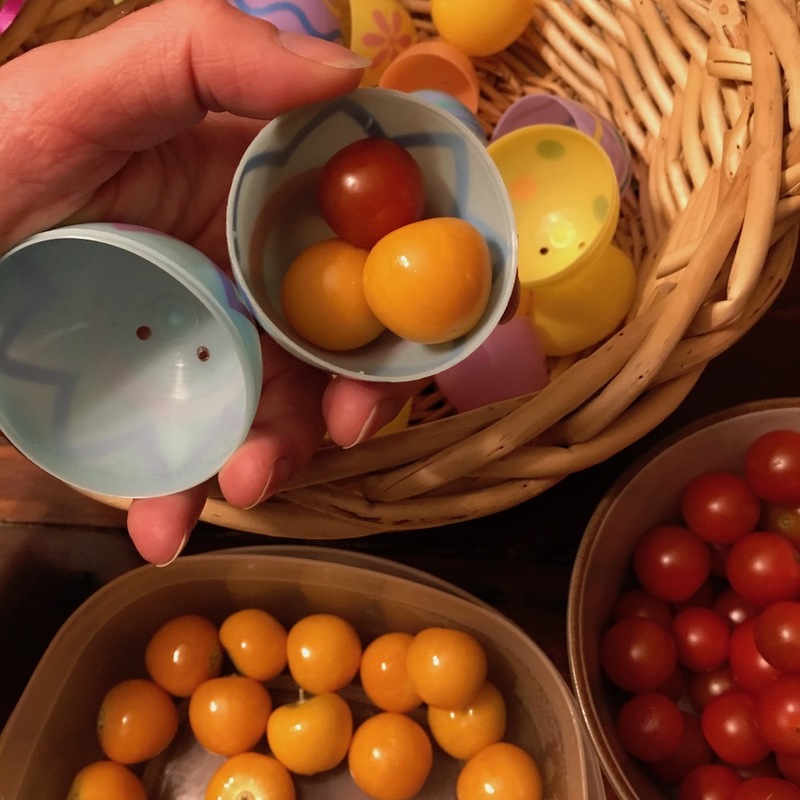 Although they’re new to me, goldenberries, cape gooseberries, or whatever you want to call them, aren’t new at all, of course. They’ve gone in and out of popularity for centuries in different cultures. In my Instagram community, a well-informed follower commented “They were popular dried in the 70’s during the dehydrator fad.” When I asked a cashier at Calgary Co-op if they were new, she looked at me funny and said they’d had them for years. Uhhhh, okay. I need to get out more. You might recognize goldenberries if you see them wrapped in their distinctive protective covering, called a calyx, which chefs sometimes use to garnish pretty desserts. Apparently the shelf life with the calyx is about a month, but without, it’s only 4-5 days. Plan accordingly. In my limited experience, fresher = sweeter. Nailing down the nutrition information turned out to be tricky, even after figuring out the names. The standard reference listing for “Groundcherries, (cape-gooseberries or poha), raw” in the usually reliable US Department of Agriculture’s (USDA) National Nutrient Database contains only a partial list of nutrients for them. The Canadian Nutrient File has nothing. USDA does list label data provided by a few manufacturers, dried and fresh, (here, here, and here), but that doesn’t report on as many nutrients as we see for more common foods. I also found a detailed paper and two book chapters (here and here), as well as more data on manufacturers’ websites (here and here). There was a lot of variation between these sources, which isn’t unheard of, when you consider different cultivars, growing locations, and conditions. Since the actual fresh product we get in our stores is unlabelled (it’s not required), I hunted for consistent themes, making a giant spreadsheet, if you’re interested (nutrition geek alert). antioxidants, including vitamin C (the fresher the better), carotenoids (thus the vitamin A content), and polyphenols. Antioxidants can protect your body’s cells from damage and reduce inflammation. Regularly eating a variety of antioxidant-rich food in general can lower your risk of developing cancer, heart disease, and diabetes. 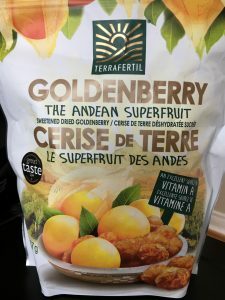 All of this, combined with the fact that they’ve been used in Andean folk medicine since ancient times, means goldenberries are often labeled a superfruit. So why not call them a superfruit? Superfruit and superfood are marketing terms with no real definition. 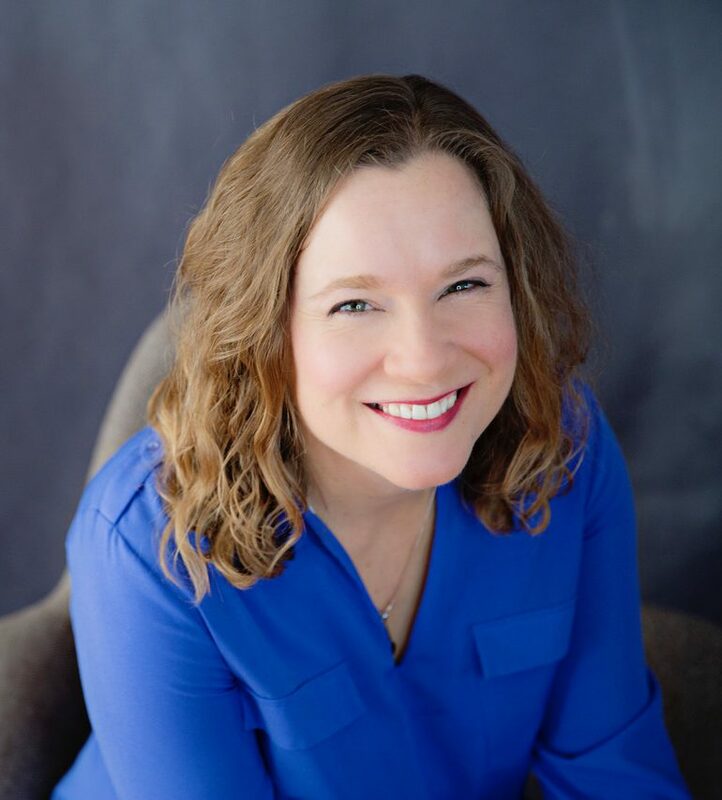 Watch, you’ll typically see them used by someone selling something — either the food itself, or hopped up wellness advice, overstating the evidence to stand out from the crowd. If I say “A diet rich in a variety of fruit and vegetables can reduce your risk of disease” (supported by good evidence) you’ll fall asleep. In contrast, the article titled “The Golden Berry That Fights Cancer” (a stretch) is near the top of Google’s ranking. In 2011 Dr. Oz referred to goldenberries as one of three “breakthrough belly blasters.” (Along with sauerkraut and miso… say what?) Absolutely not supported by the evidence, but that sensationalism is why Dr. Oz is a household name and I’m not (hahaha). Websites that refer to goldenberries as superfruits also claim that they can “detoxify the body”, “optimize kidney function,” “reverse liver degradation,” boost immunity, and much more. These grandiose statements are based on slim to no evidence. What’s the harm, you might ask? Well, number one, giving food more power than it deserves can worsen an already troubled relationship with it. 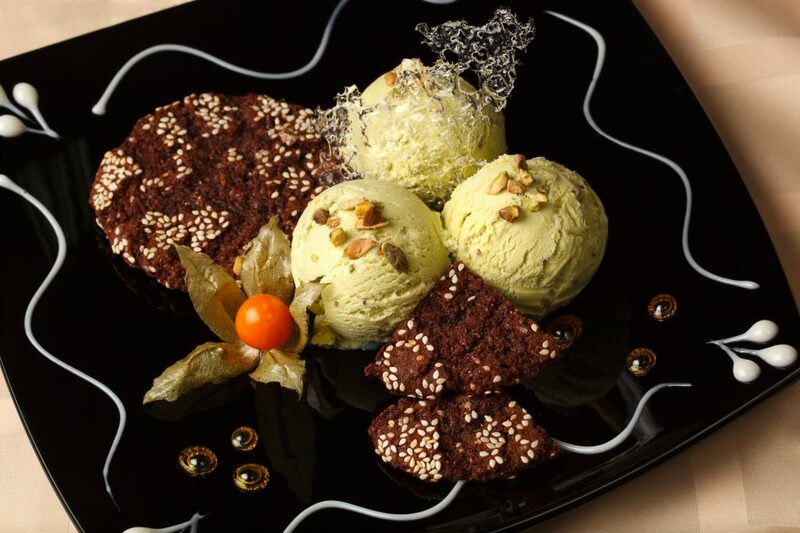 Many people think about eating in an all or nothing way, either doing a “superfood smoothie cleanse” (January 2) or “totally blowing their diet” (Dec 27). Can food just be food? 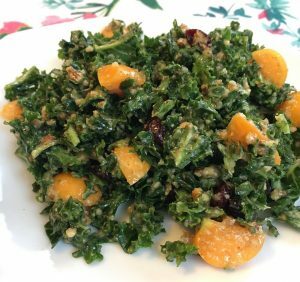 Added to this kale salad – a superfood salad! (joke) It was fantastic though. And goldenberries, like other exotic fruits that have been marketed as superfoods, aren’t widely available, and they’re relatively expensive. The 100g package I picked up at Calgary Co-op last week was $6.99. By the time we removed the calyxes, it was about half a cup of fruit. Costco is at least selling a 340g package for $5.99, but it’s hard to say how long that will be available. lots of plant foods, especially those rich in colour, contain those magical polyphenols, or you could enjoy chocolate, tea, or red wine. Many foods can support better health, even if we don’t think of them as “superfoods”. Goldenberries are novel, fun little nutrient-dense treats, but let’s not get carried away. But is this the end-all, be-all, must-have life-extending elixir of the century? Nope. 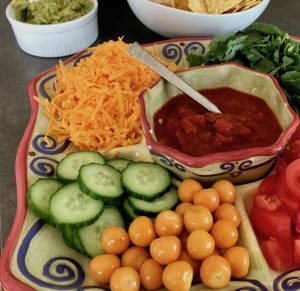 As always, your best bet is enjoying a variety of fruit, vegetables, as well as other plant foods, like nuts, beans, seeds, whole grains… you know the drill! Now don’t fall asleep on me. Goldenberry fish tacos, coming up! Have you tried goldenberries? What did you think? What did you do with them? Comment on Facebook.